In June I was presenting at the Internet of @ThingsExpo at the Javits Center in New York City. During my talk I was demonstrating how to integrate consumer devices into a business workflow. In particular, I was doing live measuring of my own blood pressure to show how to integrate consumer devices into a business workflow. Internet of Things, you know. The results were automatically appearing in my customized Web application. When the results appeared on my mobile device I was quite surprised to see that my pressure was 200/120. This was damn high. My regular blood pressure is typically around 140/90. If you think that presenting in front of a large group of people makes me stressed out, this is not the case. I’m pretty experienced speaker and, actually enjoy presenting. I thought that was a device failure. I’m writing this blog from the beautiful Crete Island, Greece. 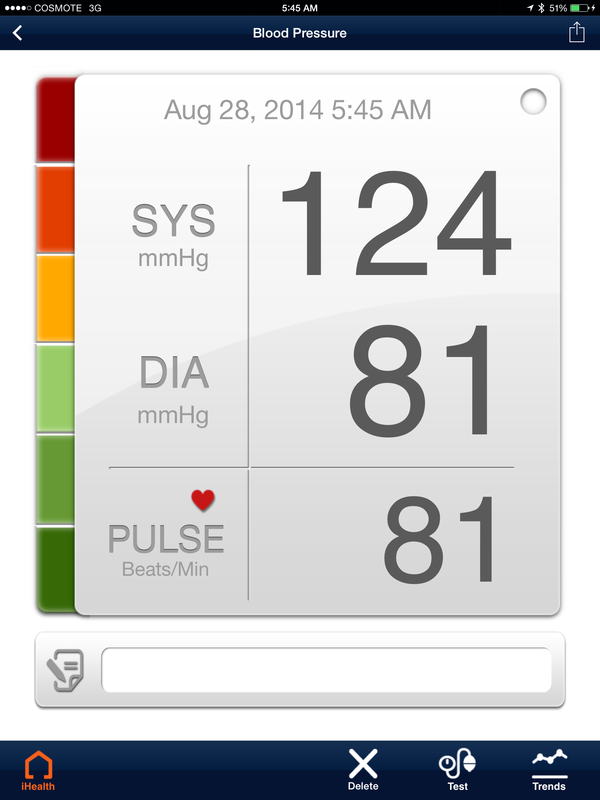 As you see, on August 28 at 5:45AM my blood pressure is normal. I’m participating in a small conference called JCrete – this is where experienced Java developers unwind. Guess what, I was delivering a scaled down version of the same presentation in a small room in front of a dozen people. The atmosphere in the room is friendly and relaxed. May be that’s the reason why the results of my blood pressure measurement where not as high as in New York: 180/110. It’s still pretty damn high. Again, I was not nervous at all. Yes, I was a little excited. This make me wondering if talking from the podium increases blood pressure? In October I’ll be measuring my pressure on stage at the conference in Moscone Center in San Francisco. I’ll update this blog with fresh numbers then. Is presenting at a conference dangerous for your health? Should people with high blood pressure avoid public speaking? If you know of some scientific studies of this subject please leave a comment on this blog. If you are a speaker yourself, do a little experiment – take a blood pressure monitor with you next time you’re presenting. Do the measurements immediately after your talk is over. Don’t be ashamed. Let’s contribute to medical science. Who Moved my Web to Mobile?